Today, I'm taking a behind the scenes look at the dress made of curtains that Scarlett O'Hara (Vivien Leigh) wears in Gone With the Wind (1939). This article is the third in a four-part series. Go here for part one and part two. 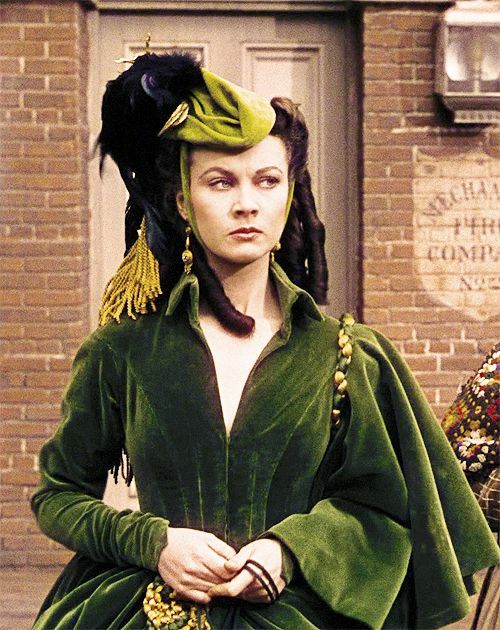 The curtain dress that Scarlett O'Hara (Vivien Leigh) wears to visit Rhett Butler (Clark Gable) in jail is certainly one of the most famous costumes in Gone With the Wind (1939). 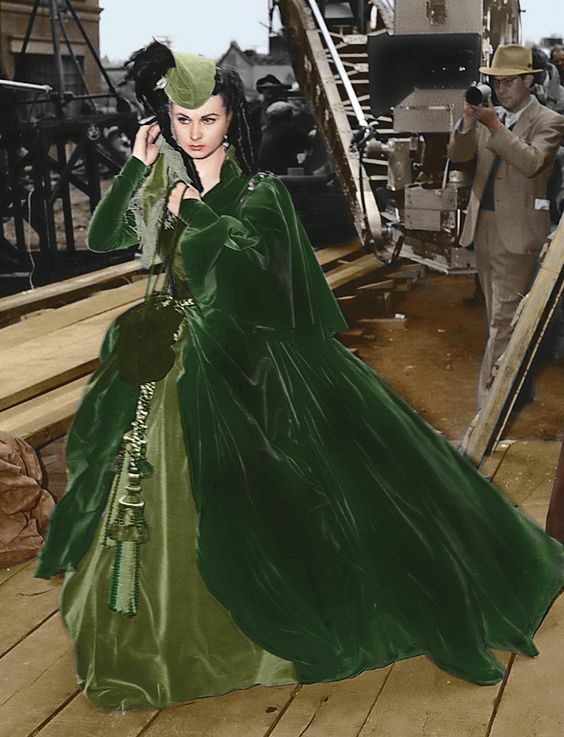 In fact, the much-parodied ensemble was based on a treasured relic in GWTW author Margaret Mitchell's family and on costume designer Walter Plunkett's meticulous research. The curtain dress makes its appearance in the second half of both the novel and the movie when a desperate Scarlett, who is badly in need of money to pay the high taxes on her family's plantation, Tara, decides to sell herself to Rhett in exchange for the much-needed cash. Scarlett can't go in the rags she wears to work in the cotton fields so she comes up with the ingenious scheme of making a hoop-skirted dress out of the moss-green portieres that are an O'Hara family heirloom. Vivien Leigh on the Atlanta set of Gone With the Wind (1939). Mitchell based Scarlett's curtain dress on a pair of drapes from her mother's family. The family's North Georgia plantation was gutted during the Union Army's invasion, except for a pair of drapes that were passed down from generation to generation as the one treasured heirloom that had survived the devastation. Plunkett, who was fanatical about research, plunged himself into accurately recreating Reconstruction-era clothes (just in case you don't know, Reconstruction is the time period immediately following the Civil War when the Union Army occupied the South. Many formerly wealthy plantation owners were reduced to a hand to mouth existence just like the O'Hara's in GWTW.). He ripped, bleached, and discolored clothing to achieve the proper poverty-stricken attire, and he even went on a thorn-gathering expedition during a visit to Charleston, S.C. (during Reconstruction, many Southern women didn't have needles and thread so they held their clothes together with thorns). Walter Plunkett's sketch for the curtain dress in Gone With the Wind (1939). 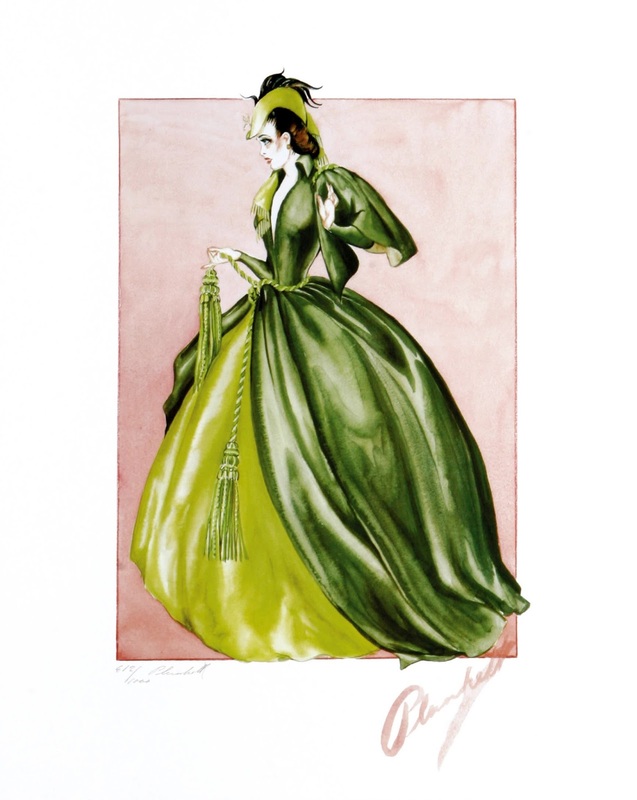 For the curtain dress, Plunkett acquired moss-green and chartreuse velvet that he exposed to the sunlight to achieve a faded appearance that would be appropriate for the much-used drapes. He then created an ingenious design that resembles a Project Runway challenge, with the curtain tiebacks made into a belt and a matching velvet cap adorned with chicken feathers. Plunkett also toned down his excellent sewing skills for a dress that looks like it could have been thrown together in one evening. The curtain dress has spawned the usual internet memes, copycat dresses, and Madame Alexander dolls, but its most famous recreation was in The Carol Burnett Show. The comedy sketch Went With the Wind follows the adventures of Starlet O'Hara (Burnett) as she tries to woo Ratt Butler (Harvey Korman) in an hilarious parody of Plunkett's design (clip below). Next week, I'll look at the red ballgown Scarlett wears to Ashley Wilkes birthday party.